sounds pretty good though !! Pretty surprising how good it sounds for what it is. Just what you need. And don’t have to worry about humidity. It's really been a pleasant surprise. I'm still getting used to the different dimensions and the proportions of it compared to the guitars I usually play. It's very tempting to play this even at home (rather than only for travel). Y'all know about my "small" hands and wrist injuries, etc. Being a carbon fibre body and all, that thing begs for some kind of integrated extendable leg rest. If you contacted them and outlined your concerns as a player and mentioned that you are also a medical man who understands physiology you could probably co-develop something with them. End up becoming rich and famous for it, too. But when that happens pls don’t forget us little guys and where you heard it first, lol. But when that happens pls don’t forget us little guys and where you heard it first, lol. I actually figured out how to get my guitar support to work with it. I just cut the suction cups to make them square rather than round and that allowed me to bring them much closer to each other to where they'd fit on the thin sides of the guitar, and it works perfectly now. In the three videos above you can see the guitar support and I'm using it while playing those three bits of music. It's very comfortable now, thankfully, and I feel like I can really enjoy the instrument. Honestly, for me it's all about ergonomics now. Give me the world's best guitar and if I am not pain-free when I play it, then forget it. Cheers! Ramzi, I wish I had your small hands! Mine are vienna sausages. 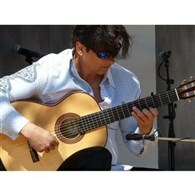 Very interesting guitar; what strings do you use? If nylon, what particular set? What is the width of the nut and the string spacing at the bridge? Thanks for sharing info about a very useful instrument. 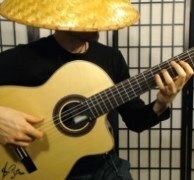 Q: Do you sell nylon string versions of your guitars? Yes, we do, but they are not officially on a product page yet! Please fill out the contact us form at the bottom of the page to let us know you're interested and we'll give you more details. Width of nut and string spacing at bridge - I am traveling now (with the guitar - haha!) so I don't have something which which to measure accurately. Remind me in a week and I can measure, or contact Ian / Adam of the KLOS guitar company and they can tell you. I had reached out to them 8 months ago when I saw their steel string version and asked for a nylon string version, and they sent me an email when there was one nylon string travel guitar available, so I bought the first one. I imagine you can reach out to them directly and ask for one if you're looking to buy.